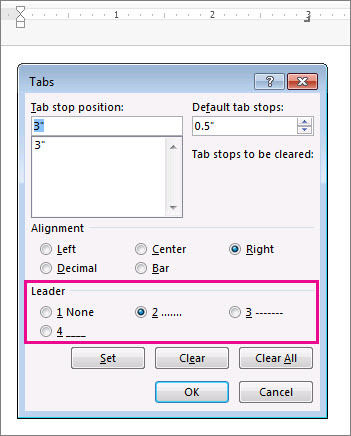 The space between tabs can show dots, dashes, or other “leader” characters to line up information, such as a directory. Type your text and on the horizontal ruler set your tabs. Click the small arrow in the bottom of the Paragraph section to open a window with more options. Click Tabs, then under Leader, click the dotted lines or other leader you want displayed. When you start a new line, the formatting will remain until you start a leader. Note: You can have more than one kind of leader if you have multiple tabs. Click each tab in the Tab stop position box and select a different leader.